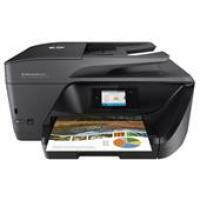 HP OfficeJet Pro 6978 printer is a multitasking printer which can print, scan, copy and fax the documents. As per the environmental standard, this printer falls under the category of energy efficient printers as it is Energy Star certified. The printer is bulky, yet spectacular due to its matte black colour and curved edges. The printer is backed with a 2.65” touchscreen display which allows easy navigation and direct printing from the printer. The printer offers high-quality business print with separate HP OfficeJet Pro 6978 All-in-One ink cartridges. One has to replace only the expended ink cartridges which in turn reduce the maintenance cost. This HP printer offers optimum printing speed of 20ppm and 11ppm for B/W and colour prints. The speed of this printer is enhanced because of the 35-sheet automatic document feeder. The printer provides good printing and a scanning resolution of 600 x 1200 dpi and 1200 x 1200 dpi respectively. For trouble-free printing the printer supports Apple AirPrint, HP ePrint, Mopria Print Service, and wireless direct printing. HP OfficeJet Pro 6978 printer can print, scan, copy and fax the document on the go by leveraging mobile printing, Wi-fi direct and cloud printing. The printer offers good quality prints with high printing speed backed by ADF. This HP printer is ideal for home projects and small businesses. How can I fix the print quality issue of white lines in the text or graphics in the HP OfficeJet Pro 6978 All-in-One printer? Step 1: Make sure that the HP OfficeJet Pro 6978 ink cartridges are installed properly and there is no foreign particle present between the printhead nozzle. Step 2: Clean the printhead. Access the printer driver window. For Window 7 User: From start menu click, control panel and then select devices and printer. Right click on your printer and open printer driver window. For Window 10 User: Click window tab and then click all apps. In the window system open control panel. Select print quality, if you want to check the quality of the print. Else, click print head cleaning. You can select the black, colour or all option according to your print quality. And then click next. Select the strength according to the quality of the print. Step 3: Check for the ink level of HP OfficeJet Pro 6978 ink cartridges. Replace the ink cartridge if the ink level is low. Step 4: Check the Print Alignment. Access the printer driver window. Jump to step 2 to know about the process to access printer driver window. Click the General tab and click printing preferences. The printer driver dialogue box will pop-up. Click on to the advanced tab. And further click print options. Select the option- “Reduced Uneven Lines”. According to your printing preference, select the type and press ok. Step 5: Check for the presence of foreign particles such as dust, debris etc. near HP OfficeJet Pro 6978 ink cartridges area. This can also affect the print quality. Step 6: If the issue is not resolved, then call for the support team. Q. I have run out of cyan ink for my HP OfficeJet Pro 6978 All-in-One printer. Can I buy the ink cartridges, from your website, individually or do I have to buy them all together? A. No, you do not need to buy all the ink cartridges together. We provide individual HP OfficeJet Pro 6978 ink cartridges of all colours so that you only need to replace the colour that has run out. We also provide multipacks containing all the colours to promote long term savings. Q. How much power do HP OfficeJet Pro 6978 printers require? A. HP OfficeJet Pro 6978 printers consume about 27 watts while operating, 5.5 watts on standby mode and about 1.2 watts on sleep mode. Q. Where can I find different HP OfficeJet Pro 6978 ink cartridge colours, other than the ones mentioned on your website? A. There are no other ink cartridge colours available for the HP OfficeJet Pro 6978 All-in-One printer. The printer uses 4 primary colours (cyan, magenta, yellow, black) that are capable of producing all the other colours. Hence, you will not find any other ink cartridge colour for this printer. Q. How long would this printer take to produce 50 copies of any document? A. HP OfficeJet Pro 6978 All-in-One printers can print up to 30 black and white printouts per minute and 26 coloured printouts per minute. Hence, it would not take you longer than 2 minutes to print 50 copies of any document. Q. Why should I choose to buy your compatible HP OfficeJet Pro 6978 ink cartridges instead of using the original ink cartridges for this printer? A. You should choose our compatible HP OfficeJet Pro 6978 ink cartridges to save up on operational costs. Our compatible ink cartridges are much cheaper than the original cartridges, while giving out the same number of pages per cartridge and the same print quality.